Johnson's Austria Turkey In Europe And Greece. 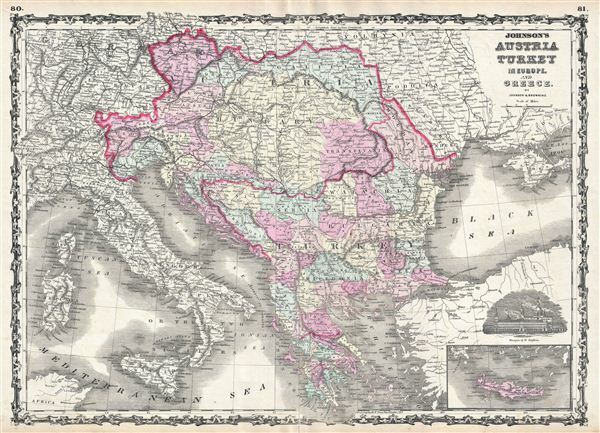 This is a beautiful example of A. J. Johnson and R. Browning's 1861 map of Austria, Turkey in europe and Greece. It covers from Italy eastward to include all of Austria, Hungary, the Balkans (Bosnia, Serbia, Albania, Croatia, Macedonia, Bulgaria, Rumania, etc. ), Greece and parts of Turkey. Color coded by district. The map identifies major roadways, cities, rivers, and various other topographical details with relief shown by hachure. Lower right quadrant offers a view of Constantinople and an inset map of Candia (Crete). The Austrian empire, founded in 1804 by the last Holy Roman emperor, Francis II, lasted only till 1866. It was transformed into the Austro-Hungarian empire after Austria was defeated in the Austro-Prussian War of 1866. This map features the strapwork style border common to Johnson's atlas work from 1860 to 1863. Published by A. J. Johnson and Browning as plate nos. 80 and 81 in the 1861 edition of Johnson's New Illustrated Family Atlas. This is the last edition of the Johnson Atlas to bear the 'Johnson and Browning' imprint. Subsequent editions reflect Ward's 1862 acquisition Ross C. Browning's shares in the firm. Johnson, A. J., Johnson’s New Illustrated Family Atlas, with descriptions, Geographical, Statistical, and Historical , 1861. Very good. Minor wear along original centerfold. Blank on verso. Minor verso repair near margins.